Sadly there is very little evidence of life in the Yeovil area before the Romans although some archaeological surveys have indicated signs of activity from the Paleolithic period, with burial and occupation sites located principally to the south of the modern town. There was, of course, not even a small village that could represent Yeovil at this time. The Early Paleolithic, or Old Stone Age, is the period of the earliest known occupation of Britain by humans and was, very approximately, from about 800,000 to 45,000 years ago. It was essentially a hunter-gatherer society and Early Paleolithic chert implements and flint arrowheads were found at Yeovil in the 1930’s, at a location roughly where Glovers’ Walk is today. In 1963 a polished stone Neolithic axe head was found near Fairmead school on the Mudford Road and in 1966 a leaf-shaped stone arrowhead was discovered near the Hundred stone. The Neolithic spanned from about 4000 BC to about 2,500 BC and was characterised by the adoption of agriculture and sedentary living, leading to the gradual decline of the hunter-gatherer lifestyle. Two Bronze Age flint tools, a finely made pressure flaked blade and a second pressure made tool were recovered from a garden at Forest Hill and a metal detectorist found an Early Bronze Age flat axe on the top of Wyndham Hill in 1982. Then there is the famous gold torc or neck ornament of the Middle Bronze Age, photographed above, which was found in the garden of the house of Mr Chapman on Hendford Hill in May 1909. It had been brought to the site in some topsoil while the garden was being landscaped by a gardener, Henry Cole, but the original site is not known as the topsoil was imported from three different localities in the neighbourhood. Skillfully made, it is described as a composite torc of the funicular four-flanged variety and weights in excess of 5 Troy ounces. A treasure trove inquest was held in Yeovil Town Hall to determine the legal owner. 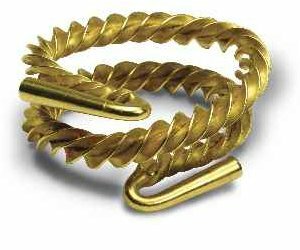 The Coroner ruled that the torc could not be considered treasure trove because "the owner cannot now be known and there is no evidence that it has ever been in ancient times hidden or otherwise concealed". The torc was sold to the Somerset Archaeological and Natural History Society for £40 and is now housed in the Somerset County Museum in Taunton where a replica is on display. According to Taylor & Collinwood, Late Bronze Age and Early Iron Age burials were discovered near Hendford Hill, south of Westlands, and near the Yeovil to Dorchester road in 1926. Again in the 1920's signs of a circular hut and traces of ashes from a hearth were discovered together with sherds of coarse black ware Iron Age pottery and animal bones, near Alden Lodge. The Iron Age, again very approximately, dates from about 800 BC and really ended with the arrival of the Romans. During 2013 salvage excavations at Yeovil Recreation Centre (specifically in the former field Lower Elm Path) recorded parts of a previously unknown late Iron Age and Roman settlement, discovered during earthmoving for sports pitches. The site was reported following the discovery of a hoard of 3,339 coins by the digger driver. Experts established that the coins were from the 2nd-3rd centuries AD, with 164 being dinarii, four brass sestertii, and the rest radiates. Some coins had been stacked and carefully bound in textile, and string, some of which remained. 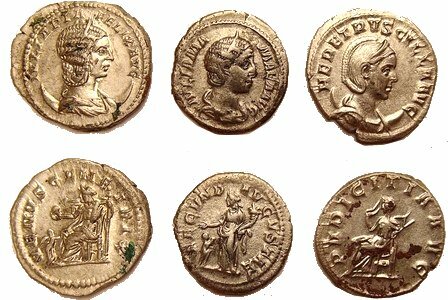 Some of the coins carried the heads of empresses, and others emperors, including Philip I, born in Syria of a Syrian father, around 204AD. To the east of the hoard, the settlement was represented by pits and ditches forming incomplete enclosures. There was also a four-post structure and evidence for some metalworking activity. It is possible that the coins, specimens of which are shown below, were intended as a source of metal for reworking although iron working is more likely. The presence of the coins and imported pottery suggests that the inhabitants had some degree of wealth and the site is likely to extend further. The coins, mainly of silver, include depictions of an elephant and a hippopotamus, animals which must have seemed exotic monsters to the Romano Britons through whose hands they passed. The hoard is thought to have been buried around 270AD. Immediately prior to the Roman invasion of Britain, the area that would become Yeovil was inhabited by the British Celtic Durotriges, a loose tribal confederation occupying an area from east Devon to south Wiltshire that included south Somerset and most of Dorset.